Cranial sacral treatments are gentle hands-on manipulation for the cranial system—focusing on the bones of the head, the membranes that cover the brain, the spinal column and the life fluids of this system. The goal is to provide the best home for the tissues of the central nervous system and to maximize the movement of the fluids that nourish, feed and communicate with this system. This work is gentle, subtle and noninvasive. Cranial work helps normalize the body structure. The hands-on touch allows the body to unwind so it can come to its full function, increasing the body's ability to be accurate in function while optimizing and enhancing genetic expression. Children change quickly and respond beautifully to this work. Many mothers and babies can experience trauma from the birth process. Early intervention can help normalize health and help establish the foundation for a life of wellness and optimum health. 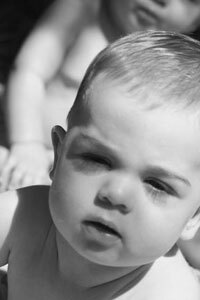 Many childhood health challenges can be addressed with pediatric cranial work. "Today, mind/body research is confirming what ancient healing traditions have always known: that the mind and the body are a unity."